We’ve released our All-Pro team for the 2018-19 NFL season. We’ve also touched on our selections for Offensive Rookie of the Year and Defensive Rookie of the Year in addition to our final offensive line and quarterback rankings for the regular season. But it’s time we look purely at PFF’s calling card, the grades. Below is a list of the highest-graded players at each position in the NFL from Weeks 1-17. 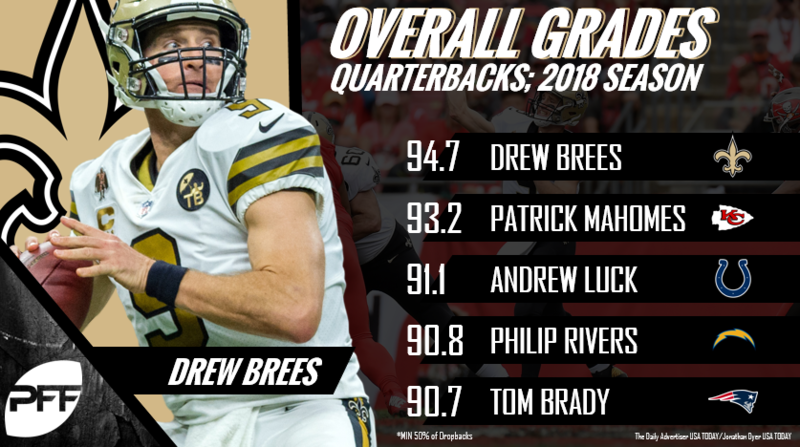 Brees was a man on a mission in 2018, earning the highest single-season overall grade of his career at 94.7. While he did post three single-game grades below 62.0, he earned 71.0-plus overall grades in all of his other contests. Brees finished ahead of Kansas City Chiefs’ Patrick Mahomes from a grades perspective largely because of his ability to limit turnover-worthy plays. He recorded a turnover-worthy play on just 1.76% of his dropbacks throughout the regular season, good for the third-lowest mark among signal-callers with 350-plus dropbacks on the year. Mahomes sat at 19th on the list with his 2.97% turnover-worthy play percentage. Running backs aren’t as valuable as they were in 1998; they’re replaceable. But that doesn’t mean they can’t play at a high level or do their (replaceable job) very well. Barkley was our highest-graded running back with at least 600 offensive snaps on the year, earning 84.0-plus grades both as a runner (84.9) and receiver (86.4) with the Giants in 2018. He broke PFF records in the passing game as one of the most elusive, versatile backs in football. Nuk Hopkins may be an alien. He broke the PFF record for total catches in a season without a drop with 115. Seattle Seahawks’ Tyler Lockett had the second-most catches without a drop in 2018 with… 57. 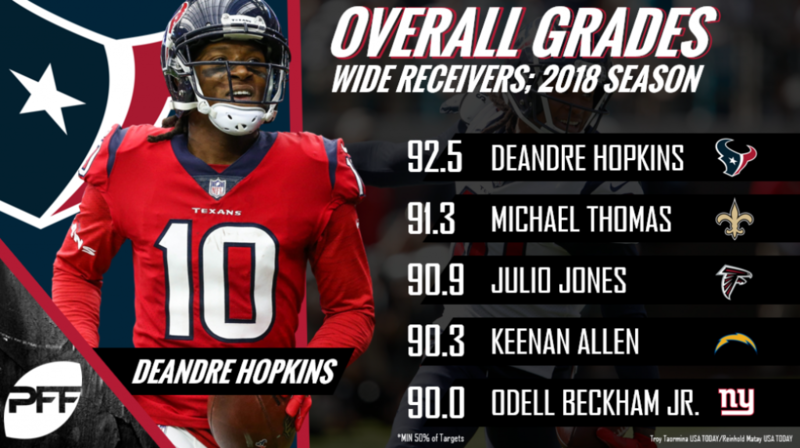 His 92.5 overall grade through the regular season is tied for the best overall grade we’ve given a wide receiver, as Hopkins joins Julio Jones (2015) and Antonio Brown (2015) at the top of the list. Kittle led the NFL in yards after the catch with 873, and Pittsburgh Steelers’ JuJu Smith Schuster – a wide receiver – came in second with just 660 yards after the catch. Yes, 49ers coach Kyle Shanahan has done a good job at scheming his tight end into wide open areas of the field at times, but Kittle still deserves the lion’s share of the praise for his YAC efforts. Oh, and his 73.3 run-blocking grade ranked third among qualifiers to boot. No fullback played more than Juszcyk, as he out-snapped all NFL fullbacks by 264-plus offensive snaps in the regular season. His pass-blocking (73.9) and run-blocking (73.8) grades were both impressive, especially considering his snap volume. To play at the level he played at a dying position in the NFL is quite the feat. 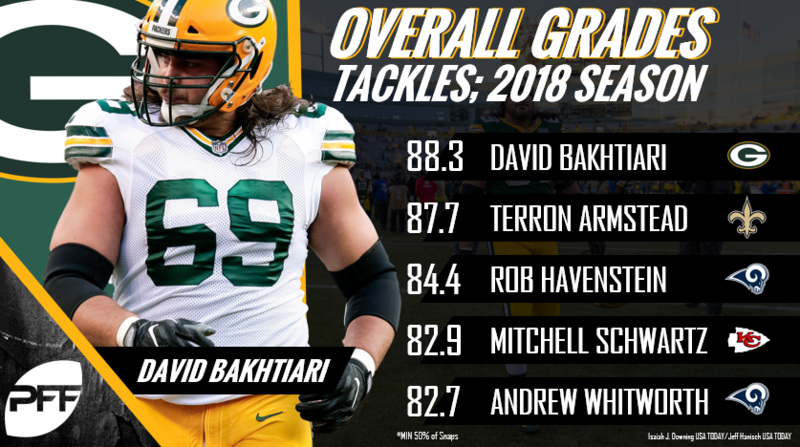 Bakhtiari is in a league of his own when it comes to pass protection. He was the only offensive tackle with at least 350 pass-block snaps to earn a pass-blocking grade above 86.8 in 2018, allowing just 28 total pressures across his 737 pass-blocking snaps. Mason isn’t the name many will expect atop the guard grades with bigger names like Zack Martin, David DeCastro among others owning most of the praise largely due to impressive play in previous years. However, the Pats’ four-year Georgia Tech product deserves his due. He led all guards in run-blocking grade (77.9) while maintaining an impressive 78.6 pass-blocking grade in 2018. Oakland Raiders’ Rodney Hudson may be the best pass-protecting center of the last five years, but he’s no Kelce in the run game. The Cincinnati grad turned Philadelphia legend led all centers in run-blocking grade (82.9) while ranking second behind Hudson in pass-blocking grade (87.7). Hudson, however, paired his league-high pass-blocking grade (90.8) with a yawn-worthy 66.2 run-blocking grade in 2018. 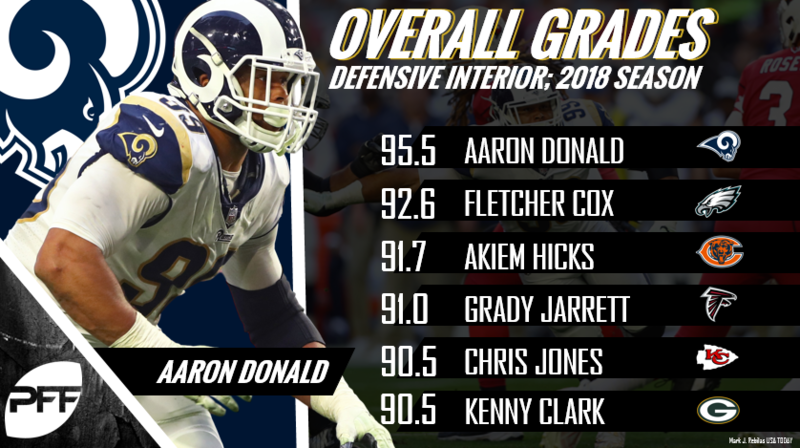 Look, Aaron Donald is good. The box score says this. PFF has said this for years. He was better this year than he was last year, and he won Defensive Player of the Year last season… The dude’s a freak of nature to freaks of nature. Campbell isn’t the elite pass rusher like other high-profile edge defenders (i.e., Khalil Mack, Von Miller, JJ Watt) are known for, as evidenced by his 70.4 pass-rush grade on the year. However, Campbell is the best run-defending edge defender in the league, and it’s not even close. His 93.8 run-defense grade and 43 run stops both led the NFL in 2018. Wagner missed just one tackle while logging 137 combined tackles, per PFF’s records. Quite frankly, that’s absurd. 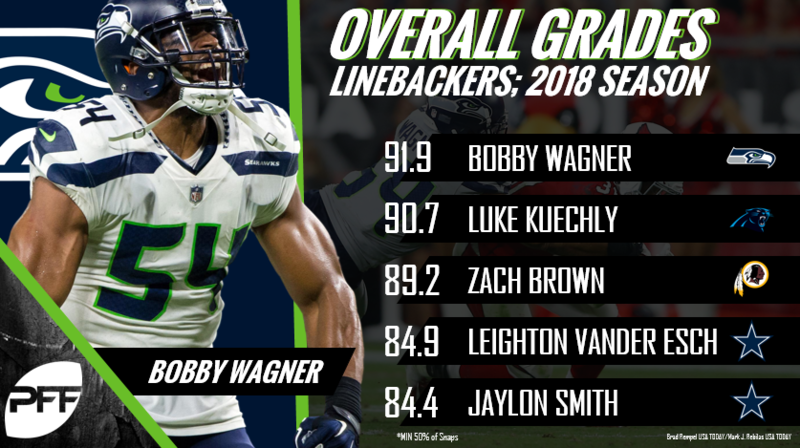 Only Carolina Panthers’ Luke Kuechly even belongs in the same breath as Wagner when referring to the league’s best linebackers. New England’s man-heavy defensive scheme played to Gilmore’s strengths nicely in 2018, as the seven-year veteran led the league in pass breakups (18) and forced incompletion percentage (27.8) en route to a spot on our All-Pro team and the highest overall grade among cornerbacks. Jackson exploded onto the NFL scene in 2018, finding the end zone eight times and leading all safeties with 10 forced incompletions, including six interceptions. Among the 57 safeties with at least 25 targets in the regular season, Jackson ranked second in passer rating allowed at 54.9. Pushing 32-of-33 field goals and 31-of-32 PATs through the uprights, Rosas dominated our grading system for kickers. And the only field goal he missed was from 50-plus yards out. 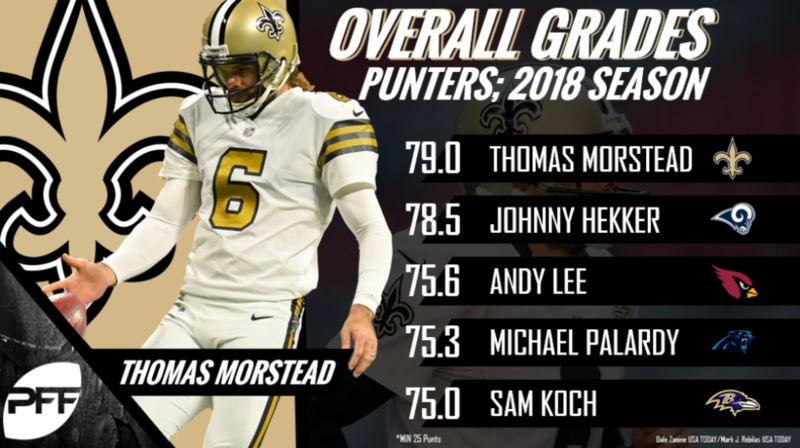 He didn’t punt a ton playing for the Saints this season, but when he did boot the ball, Morstead did it with unparalleled efficiency and class. Only Rams’ Johnny Hekker (78.5 overall grade) came close to Morstead from a grades perspective. Morstead led all punters in return yards allowed (60) and ranked tied for second in yards allowed per return (5.0). Taking the field for 256 special teams snaps, McClellan was called for just one penalty, recorded six combined tackles and, most importantly, missed zero tackles in 2018.